While waiting for my Sale-a-bration goodies (again you can get a FREE stamp set when you purchase $50 in merchandise) and Occasions Mini products, I had to make some Valentine's quickly. 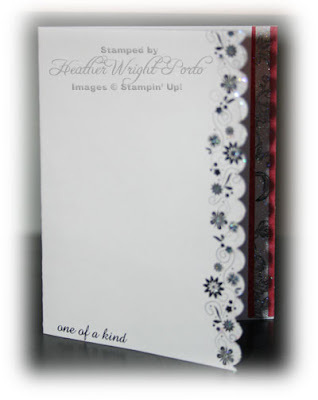 I normally spend a lot of time on my cards and love to emboss, sponge, watercolor, etc., but I really do like the simplicity of these cards alot. The glitter added just enough "sparkle." 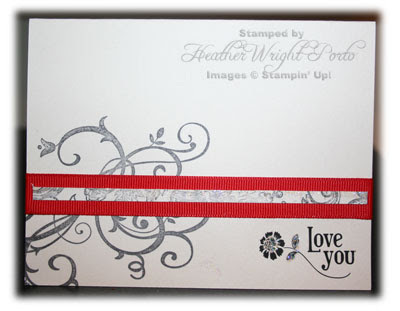 Both made from Shimmery White paper, standard card size, Real Red ribbon or patterned paper, Bella Toile background, Dazzling Diamonds, and rub-ons. the only difference is, one uses Baroque Motifs in Basic Gray and the other the Scallop Edge Punch.